Imagine swimming in the water and suddenly without warning, being slammed by something as big as a Greyhound bus... but this bus is different. It has teeth the size of dinner plates and can swallow a full-grown horse in one gulp. Second only to the sperm whale as the largest ocean predator that ever lived, no sea creature could have ever been more dangerous than the infamous and (fortunately) extinct MEGALODON shark. The Megalodon shark holds the title of being considered one of THE MOST POWERFUL predators of ANY vertebrate that ever lived, land or sea! From the Miocene Period 23 million years ago to the Late Pliocene Period 2.6 million years ago, the ancient seas were terrorized by this beast. Scientists suggest that Megalodon looked like a stockier version of the great white shark, though it may have looked similar to the basking shark (Cetorhinus maximus) or the sand tiger shark (Carcharias taurus). Regarded as one of the largest and most powerful predators to have ever lived, fossil remains of megalodon suggest that this giant shark reached a length of 18 meters (59 ft) in length and weighed over 52 tons. Some researchers have stated lengths could have attained up to 80 feet! Fossil teeth have been found that exceed 7 inches in length. Teeth are measured on the longest diagonal distance from the outer edge of the root to the tip of the crown. Their large jaws could exert a bite force of up to 108,514 to 182,201 newtons (11,065 to 18,579 kgf; 24,395 to 40,960 lbf). Their teeth were thick and robust, built for grabbing prey and breaking bone. Scientific reconstructions of this shark estimate the dorsal fin 5.5 feet tall, the pectoral fins at 10 feet in length and the tail over 12 feet high. If you were unfortunate enough to have a Megalodon shark swim over you, the pectoral fins would measure 30 feet from tip to tip with a torso in excess of 10 feet thick! The jaws were so large that this shark would be able to swallow a Rhinoceros whole. A predator this size would have most likely fed on large marine vertebrates, especially whales. The first documented mention of Megalodon remains date back all the way to the mid-1600's when writings described the discovery of large triangular teeth weathering out of rocks. They were believed to be petrified tongues of dragons and giant snakes. Later in 1667, a naturalist from Denmark correctly identified them as shark teeth and produced a drawing reconstructing a giant shark's head with the teeth and a separate drawing of a Megalodon tooth. His findings were presented in a book called The Head of a Shark Dissected. 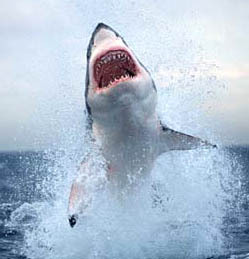 In 1835, Swiss naturalist Louis Agassiz gave the shark its initial scientific name of Carcharodon megalodon. His work relating Megalodon to the same lineage as the Great White shark are based on the similarity of the teeth of both sharks. Recent research offers up a contrasting theory of lineage. Today, there are two scientific schools of thought, both with excellent arguments, that attribute this monster shark to different lineages and names - the original name of Carcharodon megalodon, and a latter theory that has renamed the shark to Carcharocles megalodon. Megalodon inhabited a wide range of marine environments (i.e., shallow coastal waters, areas of coastal up-welling, swampy coastal lagoons, sandy littorals, and offshore deep water environments), and exhibited a transient lifestyle. Adult megalodon were not abundant in shallow water environments, and mostly inhabited offshore areas. Megalodon may have moved between coastal and oceanic waters, particularly in different stages of its life cycle. Megalodon fossil remains have been found in North and South America, Europe, Africa, Puerto Rico, Cuba, Jamaica, Canary Islands, Australia, New Zealand, Japan, Malta, Grenadines and India. Megalodon teeth have even been found in deep ocean deposits such as the Mariana Trench in the Pacific Ocean. The most common Megalodon fossils found are the teeth and in rare instances, of vertebral columns or isolated vertebrae. Megalodon fossil discoveries of teeth articulated in partial jaws have been found in Central Florida, USA, as well as Peru. It is likely that such a large shark would have had an enormous migration range and been able to dive to extreme depths. No one knows exactly what a Megalodon shark looked like but from the shape and structure of the teeth, it is most likely that the appearance was similar to a stocky Great White shark - times six! Megalodon was larger and heavier than T. rex. Though sharks are generally opportunistic feeders, Megalodon's great size, high-speed swimming capability, and powerful jaws, coupled with an impressive feeding apparatus, made it an apex predator capable of consuming a broad spectrum of animals. Fossil evidence indicates that Megalodon preyed upon many cetacean species, such as dolphins, small whales, cetotheres, squalodontids, sperm whales, bowhead whales, and rorquals. 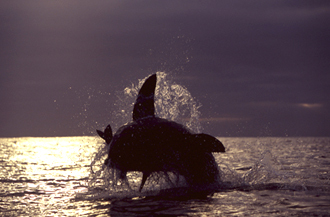 In addition to this, they also targeted seals, sirenians, and large sea turtles. Megalodon was also an opportunist and it would have also gone after smaller fish and other sharks. Many whale bones have been found with deep gashes most likely made by their teeth. Various excavations have revealed megalodon teeth lying close to the chewed remains of whales, and sometimes in direct association with them. Why did Megalodon go extinct? Some have theorized that such a large shark must have needed equally large prey to sustain itself, namely large whales. As the ocean environments dramatically fluctuated with glacier and tectonic activity, large areas of ideal habitat were affected and even eliminated. Megalodon's food source changed because of this and the combination of these factors adversely affected the ability for such a massive predator to survive. Special thanks is due Chris and Monique Fallows of Apex Predators for the use of their amazing Great White Shark photos above. Chris and Monique are dedicated to saving these beautiful and mysterious creatures from extinction. We fully support Chris in his shark preservation efforts and WE STRONGLY CONDEMN the irresponsible selling of any MODERN shark products.